I've been looking forward to this album for a long time. Charlotte Wessels is my favorite female vocalist, such a character with a breath taking voice. Martjin Westerholt writing skills flourish in Delain when combined with Charlotte, although apparently all the band had an input in this album. 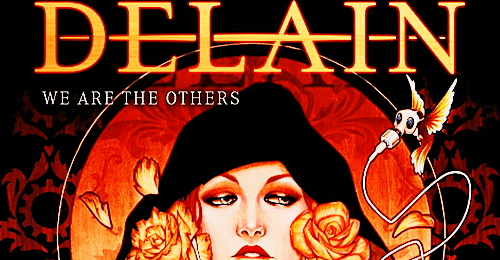 Delain's first album saw hauntingly beautiful songs with many singers but Charlotte taking the lead using her voice to devastating effect (listen to Sleep Walkers Dream if you don't believe me), then April Rail saw the band forming properly to pump out this metal album with a more power metal feel. Charlotte switched on what I shall call her 'Diva' voice for April Rain but we know she can also this sort of thing: THIS! Talent which may I add you won't find in most mainstream music, so I was praying for a combination of the two! Starting strong, Mother machine has a fantastic intro (reminds me of 'Age of Shadows' by Aryeon) very industrial, this song opens how the album continues. The modern Delain feel of rocky rifts with Charlotte hitting you with her powerful 'diva' voice switched on, yet there's that eery Lucidity feel in the back ground breaking through at times. Very listenable, great live, electricity is just a good metal song. I love the piano work at the end. I think in an interview Charlotte called this an 'anthem', thats how I see it. Its a song I feel instantly in love with, its a rallying call for people to break the norm if they want, dedicated as the album is to Sophie Lancaster who was murdered for dressing as the Goth (fairly close to where live in the country). Its so catchy and strong! One of those metal anthems! The guitar work in Milk and Honey is may favorite part, it has a metal prog (see Guilt Machine etc) sound I feel. There's nothing wrong with the lyrics or vocals but I don't feel this song works as well as some of the others on the album, still good mind. Like Milk and Honey there's nothing wrong with this song, I like it, but I find it's weaker compared to the rest of the album. There's a lot going in this song, it ends strong but just lacks something some of the other songs on this album have. A hot dark love song about somebody in love with someone they can't have so they run them over with their car.... I don't have more to add really. Where is the blood powers in at track 7 to pull the album back up from a good album to a fantastic one! An incredibly powerful duet between Charlotte and Burton C. Bell (Fear Factory). There's only really one word to describe this song: Strong. A very 'Delain' song, Charlotte as always using her voice to add that character that makes a good metal song into a great one! About people posting themselves to facebook etc it has a catchy sound like most of this album. One of my favourites on the album, fantastic sound with Charlotte showing off the high end of her voice something slightly lacking on the rest of the album. Not quiet a 9/10 but over an 8. Very catchy, very rocky, Charlotte nails the vocals and there's not much left to fault... perhaps that it's too short? A hauntingly beautiful song, perfect end to the album. A very good album, surpasses April Rain but it still doesn't feel like the best they can do. My only real issue with this album is that I was hoping for a little bit more of that Lucidity feel, although there's certainly more of that haunting vocal and symphonic effect than April Rain. Of course there's a reason for this, Lucidity was a musical project while the Delain we see now is a proper band, a live band at that. Delain blew me away live and I feel that these songs have been written with that in mind, there's less technical sound and vocals on this than Lucid because Lucid wasn't really built for live and this album certainly is! Personally this is a must buy (but get the special edition with The Gathering on it, as that song is just perfect). I think people will take different favorite songs off this album and it makes good listening, doesn't bore you. It's their best album to date but it's not a 10/10. Save that 10/10 for a later album perhaps? I'm sure Delain have a good few albums left in them, Thank god.